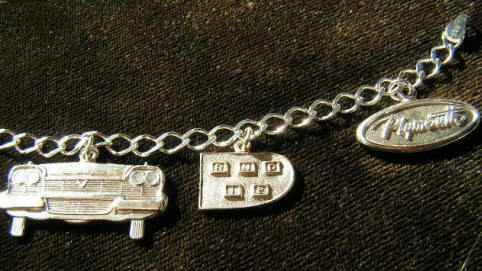 To commemorate the unburying of the Tulsarama Plymouth, we are having a special run of 1957 Plymouth bracelets made These are based on the extremely rare 1958 Plymouth charm bracelets. I have recently commissioned the same local handcrafted jewelry artist to create a special 1957 Plymouth edition to celebrate Tulsa. 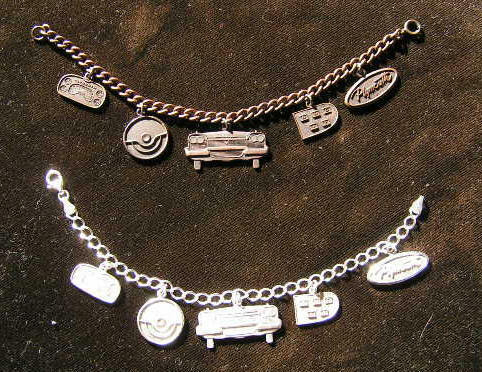 The 1958 Plymouth bracelets were stunning, and these are sure to be as well. An ordering link is at the bottom of this page. at this time. The 1958 version is shown for reference. I will upload pictures of the 1957 version as soon as they are available. 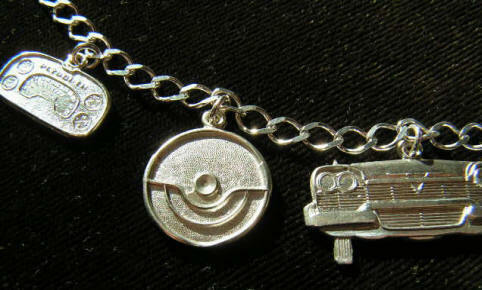 washed out the bottom brracelet a bit. Please see the detail photos below. Detail view of the instrument cluster, steering wheel, and Plymouth front. Detail view of the Plymouth front, pushbutton shifter, and Plymouth oval logo. 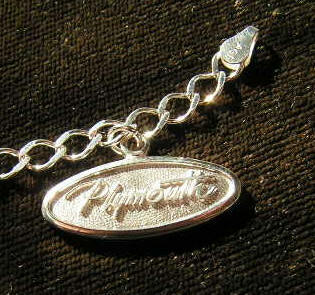 Detail view of the Plymouth oval logo and clasp. As an aside, I don't make money on these. The cost fluctuates with the price of silver, and they currently cost me $90.95 each, to which I add about $7.50 to the cost to help cover the costs of the casting molds. Priced at $98.50 each -- UPS insured shipping is $42.00. I can only offer UPS at this time. Please contact me if you still want USPS uninsured shipping for $15.00 at your own risk only. Please make checks payable to Dave Stragand. Also, please email me at dave.stragand(at)forwardlook.net to let me know that you have sent in your order.